There's something about peacocks that makes you just stop and look. They look so royal, and seem to know it too, by the way they walk! Their beautiful plumes are among the richest colours in the bird kingdom. 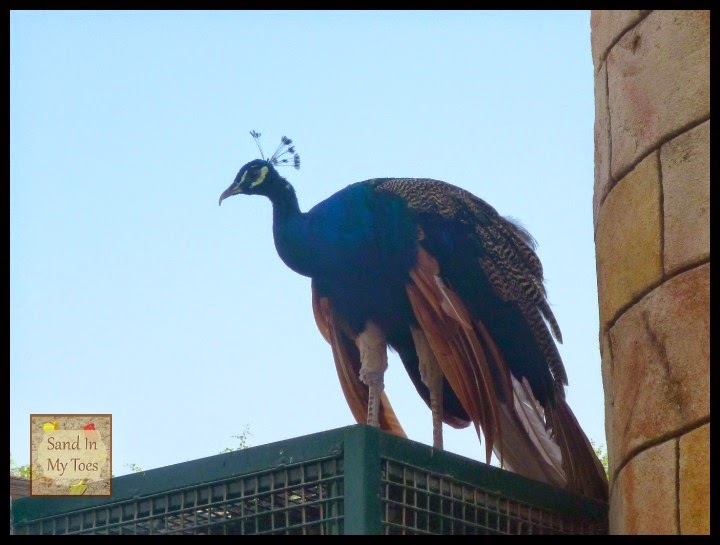 We spotted this peacock fly to the top of a cage at the Emirates Park and Zoo in Abu Dhabi (UAE) that we visited last year. It was a lovely place, and was Little Dude's first close look at animals like giraffes, zebras, and monkeys. He was so enthralled by the birds, especially the flamingoes and turkeys! I love peacocks. Some of my cousins are in the country and every time we visited they had peacocks running all around. So amazing. Peacocks are stunning. I really like this view of the peacock with the feathers down. That must really be amazing! Thanks, Kriss, it still looks so elegant! They are amazing birds and wonderful to see close up. You are right they do strut about looking like the own the place! Thanks, Merlinda, they really are awe-inspiring! They do have something royal about them, don't they?! That must be a beautiful picture! Luckily, we see them often when we visit India. I love how peacocks just ooze confidence and like they know how beautiful they are!